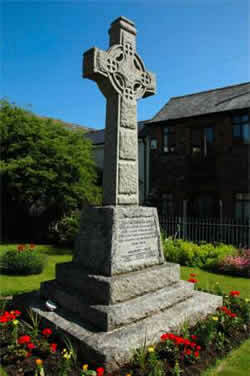 Chulmleigh's War Memorial stands in a small, well - kept garden just outside the Church gate and opposite the Globe Inn. It consists of a large carved stone Celtic cross above a four-sided block on which the names are carved. The whole is mounted on 3 rectangular stone blocks. who gave their lives for King and Country in the Great Wars"
Lance Corporal James Alderman of the 1st/7th Battalion of the Queen's Royal Regiment. Son of James and May Alderman. Died 11 May 1943 aged 27. Sergeant Air Gunner Herbert John Huxham of 50 Squadron, the Royal Air Force Volunteer Reserve. Son of Herbert and Sarah Huxham of Chulmleigh. Died 9 January 1943. Sergeant Alban Courtis Slade of 585 Corps, the Royal Engineers. Son of Frank and Grace Slade of Copnor, Portsmouth, Hants. Died 7 January 1943 aged 24. 14557254 Private Cyril John Bird of the Dorsetshire Regiment. Son of John and Evelyn Bird (née Webber). Born in Chulmleigh in the September Quarter of 1924. Killed in action on the India-Burma border 27th April 1944 aged 19. Private Edmund Henry Reed of the 1st Battalion, the Devonshire Regiment. Son of Mr. and Mrs. E. Reed of Chulmleigh. Died 30 November 1943 aged 29. Gunner Harold Tucker of 239 Battery, the Royal Artillery. Son of Jessie Sly of Chulmleigh. Died 29 November 1943 aged 28. Flying Officer Frederick George Dodd of the RAF Volunteer Reserve, 455 Squadron. Son of Jim and Evelyn Dodd and husband of Loveday Mary Dodd of Chulmleigh. Born in 1909. Died 6 July 1944 aged 35. Sergeant Vernon Coaker of the Devonshire Regiment Commandos. Son of Edwin and Doris Coaker of Cheldon. Born in 1921. Died 6 June 1944 aged 23. Private Ivan Henry Tucker of the Devonshire Regiment Commandos. Son of Charles and Florence Tucker of Kingsnympton. Born in 1921. Died on 31 January 1945 aged 24. Second Lieutenant Stanley John Hannaford of the 1st Battalion, the East Lancs Regiment. Born in the December Quarter of 1896 at Chulmleigh. Died 5 October 1917 aged 20. Lieutenant William John Peters of the 1st Battalion, the Devonshire Regiment. Son of John and Bessie Peters (née Kingdon). Born in Ashprington in the September Quarter of 1884. Died 23 April 1917. Awarded the Military Cross. Second Lieutenant John Northey Julian Powlesland of the 6th Battalion, the London Regiment. Son of John and Annie Powlesland of Wallingbrook School, Chulmleigh and brother of Norman below. Born in the December Quarter of 1895 at Chulmleigh. Died 20 September 1916 aged 20. Sergeant F. S. Brooks of the 1st Battalion, the Wiltshire Regiment. Son of Frederick and Elizabeth Brooks of 3 Ennismore Gardens Mews, South Kensington. Born 1894 in Cromer, Norfolk. Died 21 August 1916 aged 22. Sergeant George Henry Down of the 2nd Battalion, the Devonshire Regiment. Son of John and Elizabeth Down and husband of Beatrice Nellie Down of New Street, Chulmleigh. Born in 1880 at Bittadon. Died 24 April 1918 aged 38. A Sergeant T. H. Lawrence of the Devonshire Regiment has been traced but so far no matching person using this spelling of the name has been found - might this be a spelling error on the Memorial? Lance Corporal Albert William Kerslake of the 5th Battalion, the Dorsetshire Regiment*. Son of John and Mary Ann Kerslake of Benley, Chulmleigh. Born in in the March Quarter of 1892 in Chulmleigh. Died 24 November 1916 aged 24. The Commonwealth War Graves Commission lists this man as being with the Dorsetshire Regiment while the Chulmleigh War Memorial describes him as being in the RND Hussars. Both descriptions may be correct as there is some confusion surrounding the listing of RND dead at this time. Corporal Norman Walling Powlesland of the 9th Battalion, the Deonshire Regiment. Son of John and Annie Powlesland of Wallingbrook School, Chulmleigh and brother of John above. Born in the September Quarter of 1898 at Chulmleigh. Died 26 October 1917 aged 19. Corporal William James Webber of the 1st/6th Battalion, the Devonshire Regiment. Son of James and Fanny Webber of East Street and husband of Emma J Webber of 2, Fore Street, Chulmleigh. Born in 1885 in Chulmleigh. Died 8 March 1916 aged 31. Private Samuel Bater of the 8th Battalion, the Devonshire Regiment. Son of Samuel and Diana Bater of Chulmleigh and brother of Mrs. Margaret Ann Sanders of the "Barnstaple Inn" Chulmleigh. Died 6 September 1916. Awarded the Military Medal. Private John Bater of the 7th Battalion, the East Yorkshire Regiment. Son of Samuel and Diana Bater of Chulmleigh and brother of Margaret Sanders as above. Born in 1889. Died 25 March 1918 aged 29. Private Richard Bater of the 4th Field Ambulance, the Canadian Army Medical Corps. Son of Samuel and Diana Bater of Chulmleigh and brother of Margaret Sanders as above. Born in the March Quarter of 1891. Died 16 August 1918 aged 27. He held Canadian Citizenship. Awarded the Military Medal. Private Francis Chard of the 1st Battalion, the Devonshire Regiment. Son of John and Emma Chard of Garland, Chulmleigh. Born in the December Quarter of 1895 in Chulmleigh. Died 28 June 1915 aged 20. Private John Chard of the 8th Battalion, the Devonshire Regiment. Born in Burrington in 1894, Died 5 July 1916 aged 22. Private Lewis Chalkley of the Irish Battalion, the Middlesex Regiment. Son of James and Emma Chalkley. Born in the March Quarter of 1889 in Wincanton. Died 29 August 1917 aged 28. Private Archibald Sidney John Cox of the 9th Battalion, the Duke of Cornwall's Light Infantry. Son of Richard and Ellen Cox. Born in the March Quarter of 1886 at Chulmleigh. Died 8 July 1916 aged 29. Boy 2nd Class Thomas George James Down of the Royal Navy serving on HMS Powerful. Son of John and Annie Down of Shorts Cottage, Chawleigh, Chulmleigh. Born in 1900. Died 3 October 1918 aged 18. Believed to be Private Albert Cecil Gillies who served with the Australian Infantry and died on 30 May 1916 aged 18. He was the son of Robert and Mary Gillies and became an Australian citizen. Private Hermon Davis Hulland of the 3rd Battalion, the Devonshire Regiment. Son of Jesse and Sarah Hulland of East Street, Chulmleigh and husband of Ellen Hulland of Okehampton. Born in the September Quarter of 1889 in Chulmleigh. Died 29 March 1915 aged 25. Private Gilbert Hammett of the 52nd Battalion, the Devonshire Regiment. Son of Isaac and Sarah Hammett of St. Giles, Torrington. Born in the December Quarter of 1900 in Torrington. Died 11 November 1919 aged 19. Private George Henry Joce of the 1st/5th Battalion, the Devonshire Regiment. Son of George and Margaret Joce of Boycott Farm, Chulmleigh. Born in the September Quarter of 1893 at Stoke Rivers. Died 11 November 1918 aged 25. Private William Tarr of the 7th Battalion, the Somerset Light Infantry. Son of Samuel and Ellen Tarr of East street, Chulmleigh. Born in the March Quarter of 1899 at Chulmleigh. Died 30 May 1918 aged 19. Private Frederick Thorne of the 3rd King's Own Hussars. Son of Richard and Jane Thorne of New Street, Chulmleigh. Born in the June Quarter of 1890 at Chulmleigh. Died 19 February 1915 aged 25. Stoker First Class William Thorne of the Royal Navy, HMS Goliath. Son of Richard and Jane Thorne of New Street Chulmleigh and husband of Alice Thorne. Brother of Frederick above. Born in the June Quarter of 1883 at Chulmleigh. Died 13 May 1915 aged 32. Private P. Turner of the 2nd Battalion, the Devonshire Regiment who died 3 December 1917. His connection with Chulmleigh is not known but he may have been an orphan called Philip Turner, born in Tiverton in 1897, who was brought up by an Aunt and Uncle in this area of Devon. Private Frederick Thomas Webber of the 9th Battalion, the Devonshire Regiment. Son of Richard and Mary Ann Webber of Chulmleigh. Born in 1885. Died 6 September 1916 aged 31. The final entry on the memorial is not straightforward. It is not correctly placed in the alphabetical listing and appears to have had the original initial changed. It has not been possible to find a match in the Commonwealth War Graves Commission listing for the Cheshire Regiment so this entry is not yet confirmed.